Do we need to get a Tobacco License? Tobacco wholesales, retailers and vending machine operators must be licensed as dealers by the Pennsylvania Department of Revenue. 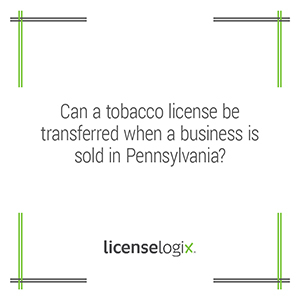 These licenses are not transferable, so when business ownership is transferred, the new owner is responsible for obtaining a new tobacco license. For more information please visit our Tobacco Licensing page. Our experts will guide you through the process to ensure your business holds the proper license.